Home / Blog / News / What is the impact of LED grow lights on indoor horticulture crops? The indoor lighting research being conducted in the lighting laboratory is only with LED grow lights. The LED fixtures that are being used were designed by OSRAM. A similar OSRAM LED product is now being marketed as Phytofy. “The OSRAM fixtures we are using in our studies deliver seven different wavebands and each one can be independently controlled,” Runkle said. “We are using the OSRAM fixture in all of our indoor lighting studies. This fixture features a sophisticated lighting system that enables us to deliver an infinitesimal number of combinations of light intensities and different wavebands. Runkle said working with different crops, the indoor lighting research being conducted is trying to elicit some very different quality traits. “Seedlings are typically grown economically in greenhouses,” he said. “To produce anything indoors is going to be more expensive. The challenge and the reason that we are looking at ornamentals in indoor production is that there is still a lot of seasonal variability. Runkle said the research with leafy greens will look at the impact light can have on different attributes of the plants. Leafy greens research at Michigan State will focus on the impact light can have on different attributes, such as texture and yield. Photos courtesy of Erik Runkle, Mich. St. Univ. Runkle said with floriculture crops the focus is on flowering and the growth aspects for compactness. Another area of research Runkle is interested in studying is to determine how light interacts with other environmental parameters, especially temperature. Most of the LED grow light research that has been done with leafy greens has studied the effects of red and blue light. 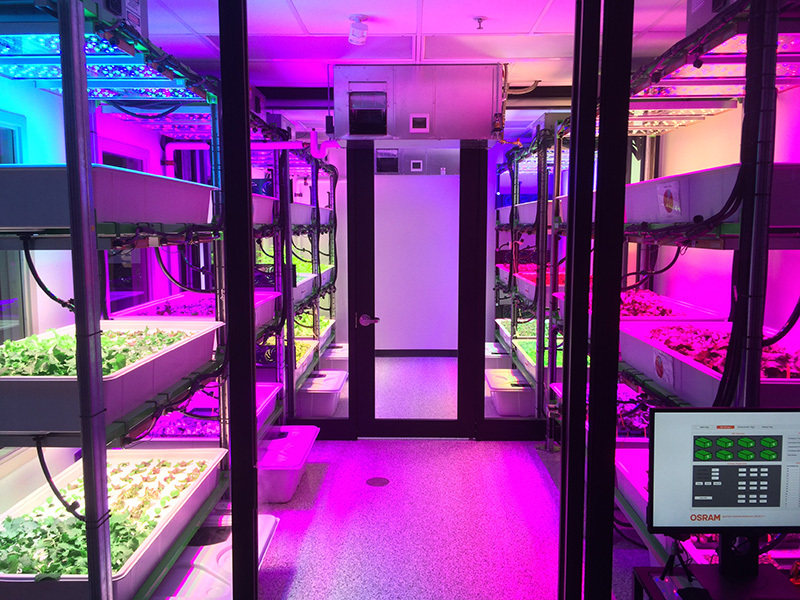 “We have a fairly good understanding of the interaction between red and blue light and how that affects leafy greens,” Runkle said. Researchers at Michigan State will study the impact of adding far red wavebands to the light spectrum on floriculture crops. For the floriculture crops Runkle is studying, the focus is on collecting more details on the benefits of adding far red to the light spectrum. “We know that there are benefits to far red, but how much far red needs to be delivered to get the positive benefits, which would be early flowering without the drawback of growth extension,” he said. “It’s really trying to dial in that waveband, particularly how much far red is needed. One of the studies being done by Runkle’s research team is comparing the effects of different light spectrum wavebands to white light LEDs. “Some white LED grow lights are relatively inexpensive,” he said. “We want to determine if there is a benefit to the customized spectrums, which would probably make them a more expensive product. Growers could decide whether to purchase fixtures with a fairly unique spectrum and receive their benefits. Runkle said some companies are manufacturing customizable fixtures for growers. For more: Erik Runkle, Michigan State University, Department of Horticulture, East Lansing, MI 48824; runkleer@msu.edu. Controlled-Environment Lighting Laboratory, https://www.canr.msu.edu/profiles/dr_erik_runkle/cell. Additional lighting articles are available online at https://www.canr.msu.edu/floriculture/resources/light-management. Erik Runkle’s indoor lighting research is being supported by the American Floral Endowment, OSRAM Opto Semiconductors, OSRAM Innovation, MSU’s AgBioResearch, USDA Floriculture & Nursery Research Initiative, Floriculture Research Alliance partners, and horticultural companies that support MSU floriculture research.